I'm excited about today's post! Just five days till we welcome spring, and there's nothing I love more than giving my home a little refresh for a new season. That little bit of sprucing adds some feel-good charm. Some of these items I own, while others are very much on my wish list. And y'all, each of these items is UNDER $50! one. Turkish towels are my very favorite. The fabric is next to perfection, which is why I love using them in the kitchen for drying hands. And these pretty, striped versions would be lovely for this time of year. two. I'm a lover of wall accents. From tobacco baskets to thrifted baskets, I like using the natural look to add character to a room. I have these two different-sized rattan baskets on my "wish list." Who else?? three. I don't know about you, but coasters are a necessity in our home. I love this pop of blue, but eclectic mix of patterns in this set. four. I cannot get enough of this bright pink wreath. It's such a welcome pop of color on my front door. And I love that it's a dried wreath and not artificial. SO pretty! five + six. These two go together for me. I have recently really come to love shades of pink done in the right way. And I think this bowl + a pop of orange with faux orange vase filler would look amazing combined! 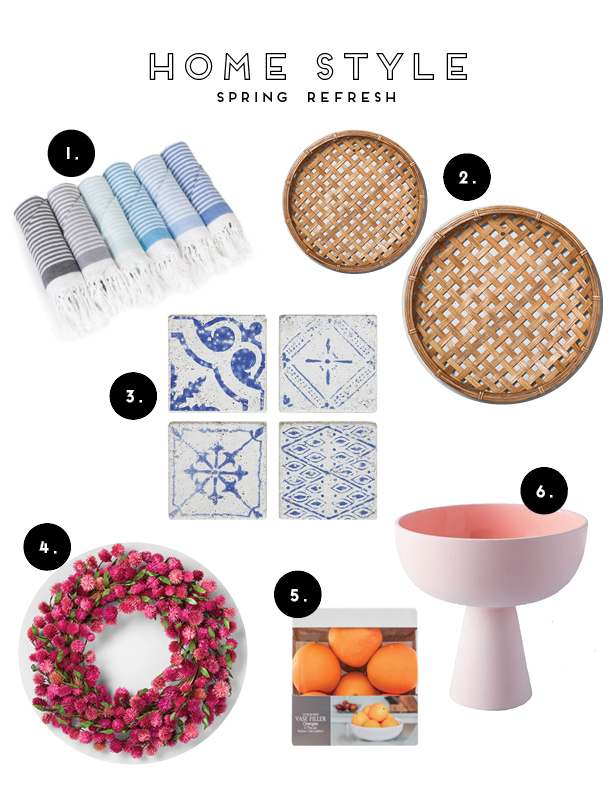 I hope this gives you a little inspiration for brining some spring-like touches indoors as we move out of winter. What is your preferred way to decorate for the new season upon us? ?